“Islandia” is a a classic novel of utopian fiction by Austin Tappan Wright, a U.C. Berkeley Law School Professor. Written as a hobby throughout his life, it was posthumously published in 1942, after being edited down from a bulky 2300 pages! Wright created a fully realized world much like Tolkien’s “Lord of the Rings”, but without magic, so it is much more a utopia than a fantasy. My friends enjoyed this book so much when they first got married and had no money, she told me, that they read it together every evening, and with the length of the book it furnished a lot of entertainment for a struggling young couple dreaming of the future. Creating Islandia’s civilization became Wright’s lifelong leisure occupation, and included a detailed history, geography, language, geneology, literature, and culture. An amazing feat of imaginative writing. After borrowing the book twice from my friend in the 70’s, then buying it and reading it a third time, I was thoroughly hooked on this believable civilization which lay “at the tip of the “Karain semi-continent in the Southern Hemisphere,” and which was fully accessible by an adventurous spirit, though one of the interesting factors was their rule of limiting access to Islandia to a bare one hundred visitors at a time. Now that is a brilliant concept! Islandia’s culture has many “progressive” features. For example, prostitutes are rehabilitated back into respectable society, in this sexually permissive community. Another attractive feature is the citizen’s love of nature, which brings about their rural lives. As a confirmed city dweller, I am fascinated by the thought of living in a society where people know one another, where we grow our food, and where our homes are built and decorated with natural materials. There is handmade pottery, woven fabrics, handmade heavy wood furniture, and the larders are filled with the spoils of their gardens preserved for later use. Throughout my three readings of this book, I have lived with these people, grieved at their mishaps and deaths, and wondered what happened to the rest of us! Why didn’t we get it? Over the four decades I have known my friends, and enjoyed the beautiful home built by them, with its handwoven wool fabrics, pottery, furniture made by the husband, heavy handhewn gates with their wrought iron hinges, I finally “got it”, they are living life by the book—living an Islandian life. Stairs present a mystery. They can manifest man’s desire to elevate himself to the highest level, to enable him to understand his place in the world. At the top of the staircase, does he find enlightenment or—nothing? He will never know unless he climbs the steps. But the effort seems worthwhile. In another instance, they may merely be a way to move from one level to another. It depends upon his degree of anticipation and ambition. A clay pot sitting in the sun will always be a clay pot, but it needs the white hot heat of the furnace to become porcelain. For some, a simple life over a slightly rolling terrain may be enough to bring him fullfillment. He can relax in the familiar comfort of deep resounding sound as in ocean waves. We become like aging ships who spring a few more leaks each year. One of the great wonders of life is the variety of aspiration and the means to achieve it. I know you probably don’t want to think about it, but that appendage at the end of your leg has become big business, both for the fashion and the medical industry. Jimmy Choo, Ferragamo and Dr. Scholl are coining big bucks off those twinkle toes. From classy six-inch heels to corn plasters, we tender a lot of our hard-earned cash to heal and enhance our feet. After the first inspection of the baby toes to ensure that all ten are present, we tickle them, play “this little piggy”, and then forget about them, leaving them to fend for themselves. During our young adulthood, we reach a comforting concinnity with our feet, annointing them, adorning the toes not only with polish, but with tiny rings, hoping they will reach the same level of beauty as the hands. We read phrases such as “her graceful white hands, long tapering fingers, etc.” But your never read such accolades given to the foot. Feet are crammed into too-tight shoes, sloppy flip-flops and expensive athletic shoes and expected to thrive and remain beautiful. Instead, they go their own way. In their beauty period, while revelling in the toeless barefoot sandal, we carefully trim and clip the toe nails, but when the mature arms can’t quite reach them and older eyes can’t see them we must pay someone to look at those long-gone cute feet and cut the thickened unpolished toenails. I’m not there yet, but I can see it coming some day and it isn’t a pleasant prospect. Companies such as Dr. Scholl’s supply a myriad of aids for the tired and aching feet. There are supports for flat feet, hammer toes, corns and bunions, toe spacers and even “dropped foot” (although I can’t imagine where they go if you drop them.) Without these palliative aids, bad feet can cause a misalighnment of the spine and other unpleasant problems, not the least of which is having to resort to ugly clunky shoes, canes and walking sticks. Yes, we take our feet for granted, but try walking around without them. There is a great difference between Hanukkah and Christmas materiel. Latkes begin with a tasteless vegetable—potatoes—that are cleverly fashioned into something everyone likes. Fruitcake begins with fruit, which is delicious to begin with, and then gets pounded into dense oblivion and kept in the freezer until the day you move out of your apartment. Now in this season between seasons, I am baking fruitcakes. We eat a lot of latkes at all times of the year; we just call them potato pancakes, and delicious though they may be, they are not particularly festive. Now I can almost feel the sneers and ughs flying through the ozone from assorted fruitcake haters. (Some are even related to me.) But today I am going to bring you, at absolutely no cost to you, the recipe for the best fruitcake you never ate. It was given to me by a long deceased cousin of Dr. Advice, and I treasure it as I do the recipe for my mother’s tapioca pudding. sift dry ingredients over and mix till well coated. Stir into nut mixture till well mixed. Spread in pan and bake till done. Cool in pan 15 min. Remove and peel paper. Store in fridge. Keeps 5-6 weeks if you can stay away from them. I wrap mine well if made this far in advance of a holiday and store in freezer. Well, how hard it is to learn a language depends on what language you speak to begin with. If you speak English you have a head start as it’s a Germanic language. But German doesn’t make it any easier with all of its genders, 12 ways of forming plurals, etc.—and that’s only scratching the surface. Some years ago, when a grandson started high school, he needed to choose another language to study, so he chose Spanish. However all the classes were full, but as he was passing an open door to the German classroom he saw it was nearly empty, so he went in and took a seat. A clever way to choose a second language. Another grandson took three years of Spanish in high school, 4 years at university, and went to Spain for a semester of study. He lived with a Spanish family, and took his classes in the language, but when we went to visit him in Granada, and I said how happy I was he could translate for me he blithly told me “But I can’t speak Spanish!” The pronunciation was different, and people spoke much faster than he could translate. A granddaughter fell in love with French and made it her major at University. I’m sure she speaks it beautifully, as it is a beautiful language, and the best part is that she married a man who also speaks it, so they can chat away and people like me who doesn’t even speak Latin can’t understand a word. I’m beginning to watch a lot of French movies though. We live in the age of possibility though. Living in a diverse community, our schools teach a variety of languages. At the voting polls this month alone the ballots were printed in five different languages. English, Spanish, Chinese, Tagalog, and Russian! We stopped into a funky little store in Pescadero for an ice cream cone, and were surprised to see the young man behind the counter holding a hooded falcon on his hand. Never having seen a falcon up close and personal, we were fascinated with the creature. The young man was a member of a falconry club and introduced us to his feathered friend as long as we kept our distance, which I was happy to do after taking a look at his extremely long and sharp toenails. 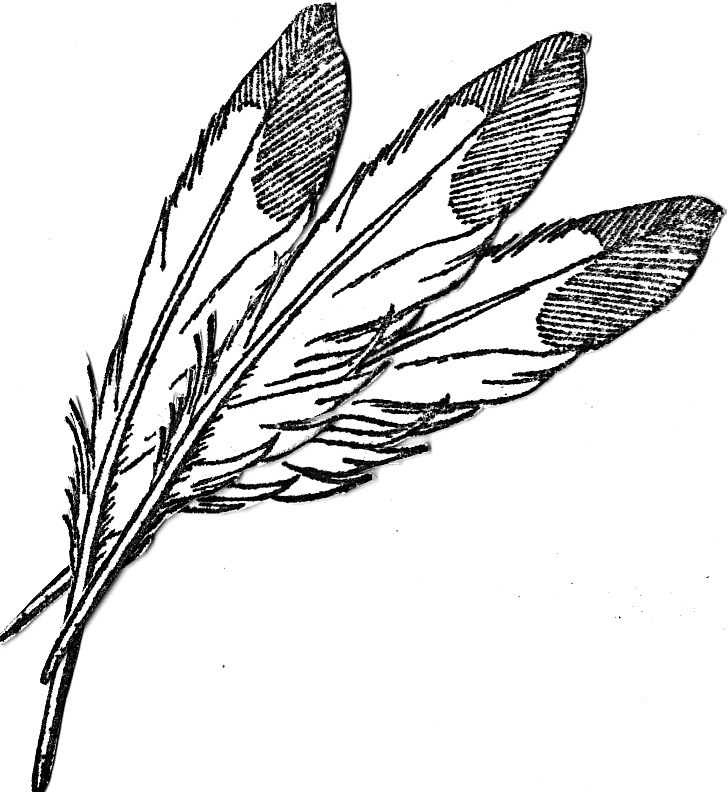 Falconry is the hunting of wild quarry by means of a trained bird of prey. The art of falconry may have begun some 4,000 years ago in China or Mongolia as the falcon was a symbolic bird of ancient Mongol tribes. Traditional falconry knowledge probably spread into Europe during wars in Arabic countries. Today, there are falconry clubs all over the world. In nomadic societies like the Bedouin, it was not practiced for recreation. Instead, the birds were trapped and hunted on small game during winter months in order to supplement a very limited diet. Finishing our ice cream, the young falconer told us that ‘If he doesn’t feel like hunting, he won’t. People think birds like to fly, but they only do it to get something to eat.’ That may be true, but I still like to think the small birds visiting our birdbath are having a good time. 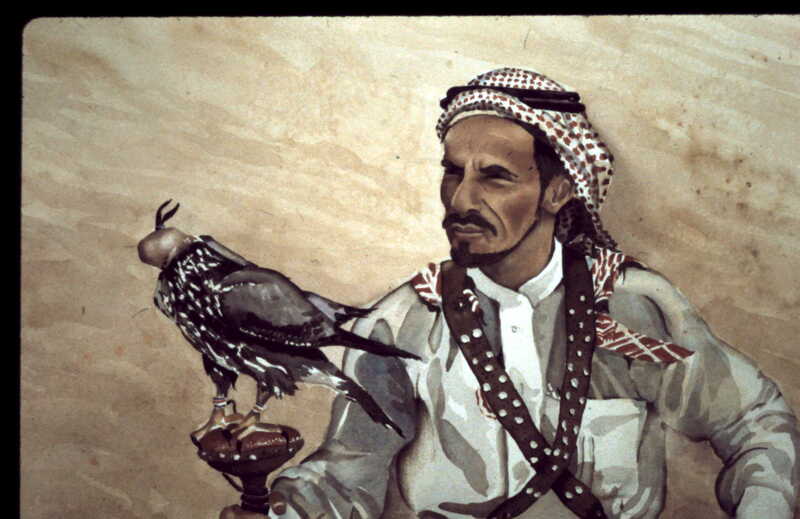 This painting of the falcon and his uncompromising companion was done from a black and white photo of my aunt and uncle, who lived in Saudi Arabia for many years. Previously I said I was in awe of translators, but heck, we’re all translators. Everytime we talk to our family, our dogs, our friends—we’re translating what they are saying into something we want to hear. What did your friend really mean with that look she gave you after your third glass of wine? What did your husband mean when he flounced out the door in the morning just because you were a little late getting home from your bridge game the afternoon before? Your three year old doesn’t really mean he hates you when he says he does, he wants you to set him straight about who really wears the pants around here. It keeps him in his comfort zone. We all have to live in this family, this community, this world. It behooves us all to darn well get over it and get together. Get over being miffed at your friend and just give her that recipe she’s been begging for. Friends aren’t all that easy to find anymore. Go ahead and buy your kid that toy he’s whining for (unlkess it costs more than the mortgage payment. ), And believe me, your husband will be home tonight and grateful for that special dinner you’re going to fix him. After all you could have called him yesterday. Don’t make it too difficult for others to translate you.